Set up by the exchange4media Group, India’s largest publisher of web and print publications on marketing, advertising and media, the CMO League is an exclusive club for CMOs in the country for the purpose of high-level knowledge exchange, thought leadership and relationship building among the senior most corporate marketing leaders and brand decision makers across product and service categories. The League brings CMOs of large companies in India together in an environment of openness and collaboration that enables them to excel at what they do and solve their biggest CMO challenges. Tailored exclusively for the benefit of top marketing executives, the CMO League will hold talks by the most respected marketing thinkers of our time from across the world, share reports and research from marketing industry leaders, and leverage the first online engaged CMO community network in India. The membership of the club is by invitation and is open to individuals holding a current CMO or Marketing Director or an equivalent position or title, reporting to a CEO, President, Managing Director or Country Head of a large company. The activities of the club include power dinners, roundtables, summits and talks involving marketing industry leaders from across the world. All events will be designed to address the common and specific issues that challenge the top marketers in the country. Promoted by the exchange4media Group, the CMO League was launched on February 13, 2013 with a talk by Mr. Don Tapscott — one of the world’s leading authorities on innovation, media, and the economic and social impact of technology. He spoke on 'Macrowikinomics: Rebooting Business and the World’. The next in the series were talks by Mr. Simon Clift, Unilever’s first Global CMO and Mr. Sanjay Khosla, Former President, Developing Markets, Kraft Foods (Mondelez International) in August 2013 and January 2014 respectively. 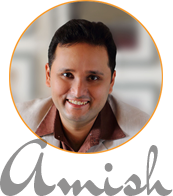 In this edition, we have the Best Selling Author – Amish Tripathi who is described ‘India’s first literary popstar’ and his unique combination of crackling story-telling, and profound philosophies has made him an overnight publishing phenomenon. From a couple thousand years BC to couple thousand years AD Using history, mythology and philosophy to create a bestseller - That’s Amish for you. If that isn’t enough Amish’s Shiva Trilogy is the fastest selling book series in Indian publishing scenario. An IIM Graduate Amish used unconventional marketing tools to popularise his work. From distributing the first chapter of the book free at all major book stores to creating cinematic trailers replete with background scores. All this, of course, corroborated his faith in his content to act as a hook to the larger audience. But in his own words ‘It’s a fallacy to think a good book sells itself’ Hear Amish talk of the creative marketing Strategies that can make the difference and make good content break the clutter. Now more than ever, it has become imperative for the Brands to become content creators and create great stories to market their products/services. Striking the right fusion of marketing science and storytelling is intricately challenging. Without a well planned marketing strategy an amazing story – or even the most incredible product on earth will not get seen by anyone who cares about it. On the other hand a well researched strategy/science but a weak story/product will get lots of passive eyeballs on something that won’t make anyone give a second glance. Both are common scenarios and there is an inherent tension between the two. What is the right mix of strategy in marketing of a good product that leads to a memorable customer experience? Hear experts in the field of Marketing & content creators discuss what it takes to deliver an awesome experience.